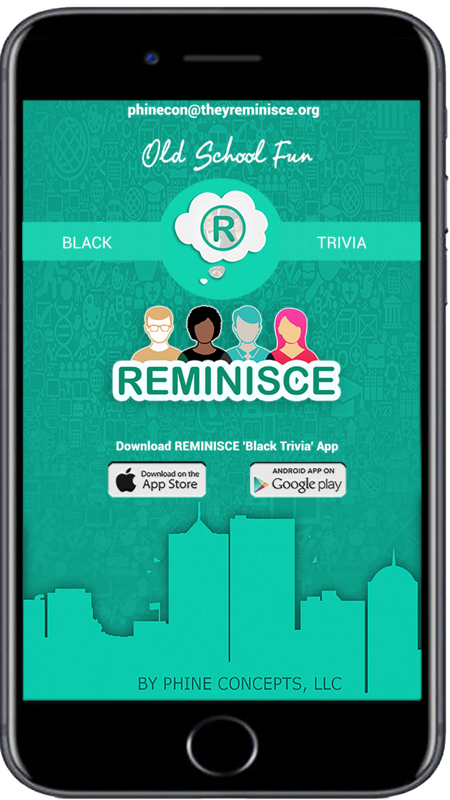 Reminisce is a new and exciting Trivia game for everyone. It is a mobile app that is currently in the App Store and will be in the Play Store soon. Reminisce has 2 categories: Factoids and Catchphrases and 5 sub-categories: TV Shows, Movies, Sports, History and Commercials. What sets Reminisce apart from other Trivia games is that Reminisce is a Melting Pot of American Trivia. And is the only trivia game out there that includes and celebrates African American pop culture. Everyone will find something in Reminisce to relate to. It is a high quality fun and educational trivia game that brings back memories of incredible American TV Shows, Movies, History, etc. that taps into the heartstrings of the American culture and allows us to laugh, cry, get mad and dream. If you have a fun question to add to Reminisce Trivia, please submit to: phinecon@theyreminisce.org. Test your knowledge. Keep the answers coming to extend your streak. The player will be in a race against time in the ‘Single Player’ mode. Select the ‘Single Player’ option. Click on the Spin Wheel and a Category and Subcategory will be selected. The player has 2 opportunities to select Category and Subcategory. Once Category and Subcategory has been selected, the player will click on the ‘Play’ button. The Levels screen will show you what Level you are on. Select the last Level. And the player will then compete against the time clock and will get total points at the end of EACH session. The player will need to get a certain # of points to unlock and advance to the next level. Instead of playing against the timer, in the ‘Multi-Player’ mode, the player will play against FB friends or total strangers… who will eventually become their friends. Select the ‘Multi-Player’ option. On the ‘Multi-Player’ screen, you will then see a list of players that are available to play with you on Reminisce, along with their scores. In addition, you will also see a console button at the top right corner of the screen, which upon clicking will show you a list of players who has sent you a notification to play. Click on an opponent (for example ‘Player B’) to begin a new game. Or click on the console to play with an opponent who has sent you a request. Reminisce will randomly select 10 questions from any category or subcategory. After finishing the questions, you will see your score and Reminisce will send a notification to your opponent. Your opponent will be notified and can play the round at any time, by clicking on the notification. No Rules! How long can you keep your winning streak? Non-Stop Play bypasses the ‘Spin Wheel’ and randomly selects the players categories and subcategories. This option is a race against time to see how many questions you can answer and how many points you can achieve in 100 seconds. Select the ‘Non-Stop Play’ option and Reminisce will randomly select the player’s categories and subcategories. The player has 100 seconds to answer as many questions as possible.